I made it to grand junction to pick up Andrew with no problems. 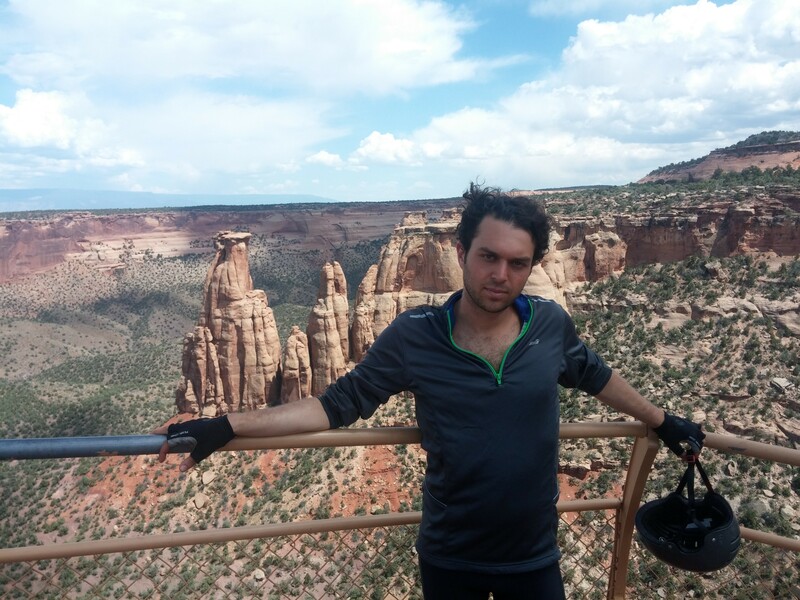 The only real highlights of the ride between glenwood springs and there is that i found a great place to get pupusas for lunch, and i cracked out a 72 mile day. After Andrew assembled his bike, i noticed he didn’t have a water bottle cage or bottle on his bike (all his water was tucked away in his panniers). I was just about to inform him of this when a guy across the street yelled to ask us if we needed any bike parts from his recycled bike shop right there, so we ended up getting Andrew hooked up for free. 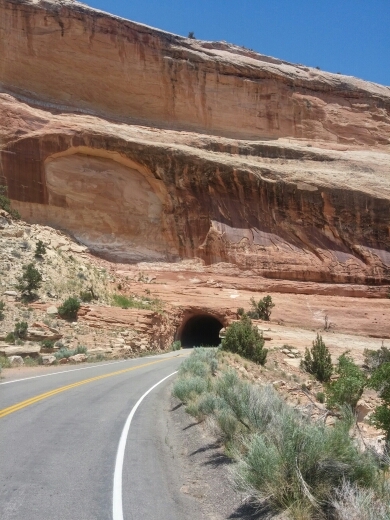 We rode up into the Colorado national Monument – a gorgeous ride – and camped there the first night. Yesterday was one of the toughest days I’ve ever had riding. 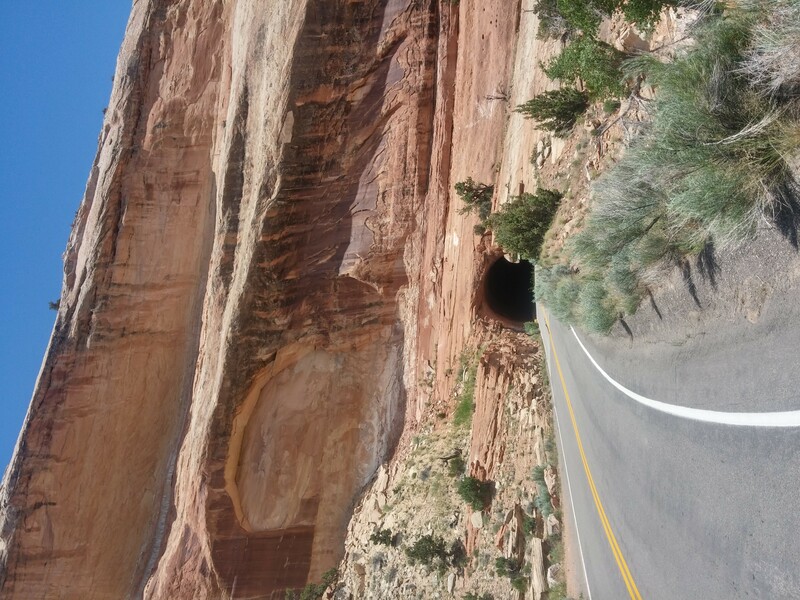 It’s about 80 miles from Fruita to moab, and there’s nowhere along the way to get water. We thought we had plenty – over a gallon each – but we didn’t plan for the 25 mile an hour headwind. We rode for over five hours, averaging about 6.5 in the brutal wind, inching our way across barren desert. 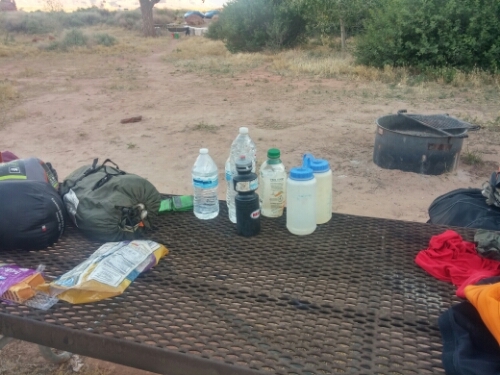 The hot wind sucked our moisture away, and we quickly went through our water supply. It eventually became clear that we had a problem, but luckily, we didn’t have to wave our empty bottles at traffic for long before Keith the Hero stopped and not only gave us some ice water, but offered us a ride. He had to turn around once because i had left my handlebar bag behind in my parched stupor, and then, after dropping us off at the next campsite, he drove all the way back from his house (about 25 miles) because Andrew had left his helmet in Keith’s truck. They don’t come much nicer than that. Now we’re at a campsite in moab, but Andrew’s knee may be broken… We’ll have to see how things turn out.